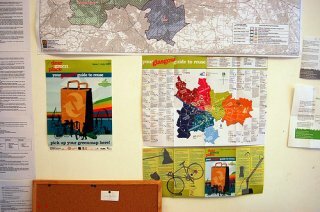 Green Maps are locally created maps that chart social/cultural and environmental assets within communities using the Green Map Icon System. There are over 300 Green Mapping Projects in production around the world encouraging people to engage with the concept of sustainable development within their own community. Radius Glasgow and members of the Electron Club are working in collaboration to develop Glasgow's first web based Google Mash up Green Map based on the Cork Green Map. We are running weekly workshops at the Electron Club designed to involve people in the project. We encourage anyone who wants to find out more about the initiative, learn new skills and contribute some time to the development of this Glasgow resource to come along. We meet Thursday night every week, 6:30pm - 8:30pm - tea and cakes provided. For more info contact hannah@radiusglagsow.org or on the programming side Kevin McDonagh kevin@appletv.co.uk or just pop in.